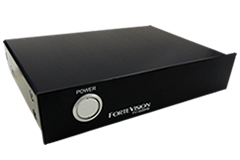 FV-3000HS sharpens low contrast moving images with our original technology "ForteVision". It is a digital image signal clarifying unit that improves the visibility of objects. Supports HD-SDI signal (1080 / 60i). Easy installation with compact design. Main features Supports HD-SDI signal (1080 / 60i). Automatic adaptation to various external light conditions such as low illumination, backlight, fog and mist. Built-in noise filter for reducing noise in low-brightness area. Original image output function when power is off. Remote control function by USB interface (dedicated software). *It can be installed at the backward of the camera equipment or at the ahead of the monitor equipment.